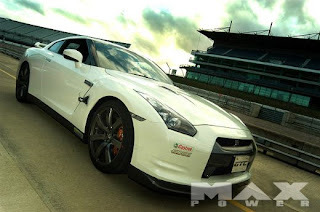 From Max Power UK's First R35 GT-R. Nissan UK was discouraging the grey import of R35's, but it won't stop everyone. "Purchased back in December 2007, Ben Linney of GTCulture has already had his GT-R built and transported to the UK. Finished on the 6th December in the Tokyo Nissan factory, Ben wasted no time in getting the 473bhp sportscar loaded into a container homebound for Southampton."